ऑपरेटिंग सिस्टम पर चलाने के लिए जरुरी है! Practicing typing to learn new methods and build on the current abilities to develop them further needs a lot of exercise. To help users down this road, numerous applications have been developed but Smart English Typing Master or Typing Tutor is Best one of them. 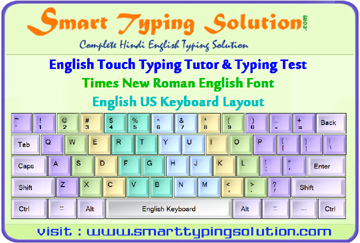 This particular software solution is designed to offer users a simple way of learning the touch type method and also improve their general typing speed and accuracy. As soon as the setup is complete, the users will be able to open the program and get to know the interface. Bent more on practicality than good looks, the main window hosts all the commands and everything is placed conveniently, so that anyone can get to the functions of Smart English Typing Master with ease. A neat feature of this tool is the illustrative set of pictures that are built-in the app and help users see what each exercise is all about and carry on according to the requirements of each lesson. A plus for Smart English Typing Master is the abundance of exercises that are included in the package and all of them are part of a group which users can select with ease. These lessons can be taken one at a time, in the order they are displayed, but users can just as well work on any exercise they feel would help them more. While typing and following the instructions shown on-screen, users can take a look at the real-time progress chart and also check out the remaining time for the selected lesson. After the practice is done, the summary that is shown in the main window will explain the results and it includes data about the typing speed and accuracy. To conclude, Smart English Typing Master seems to be a good utility for those interested in attaining a visible improvement in typing on a standard keyboard.